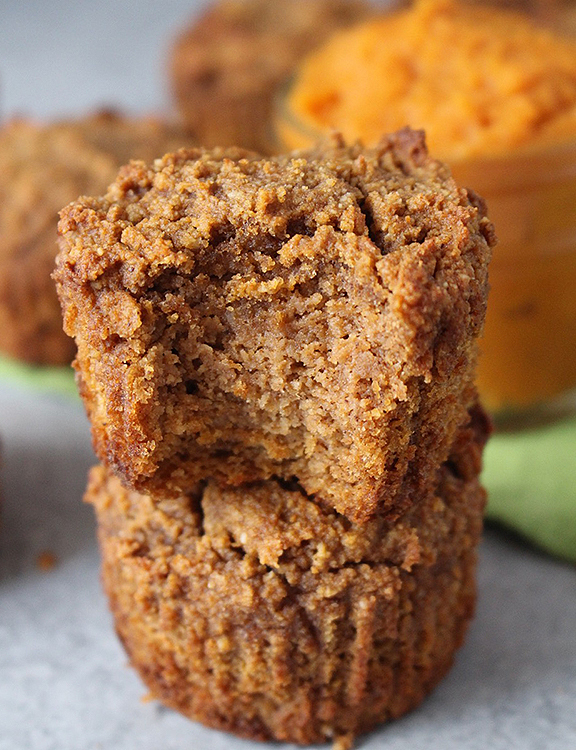 These Paleo Pumpkin Muffins are so easy to make and incredibly delicious! Gluten free, dairy free, and refined sugar free- they make a great snack or dessert. It’s September and I am so ready for fall! We had a very hot summer here in Michigan and I’m looking forward to cooler temps and all things pumpkin and apple! 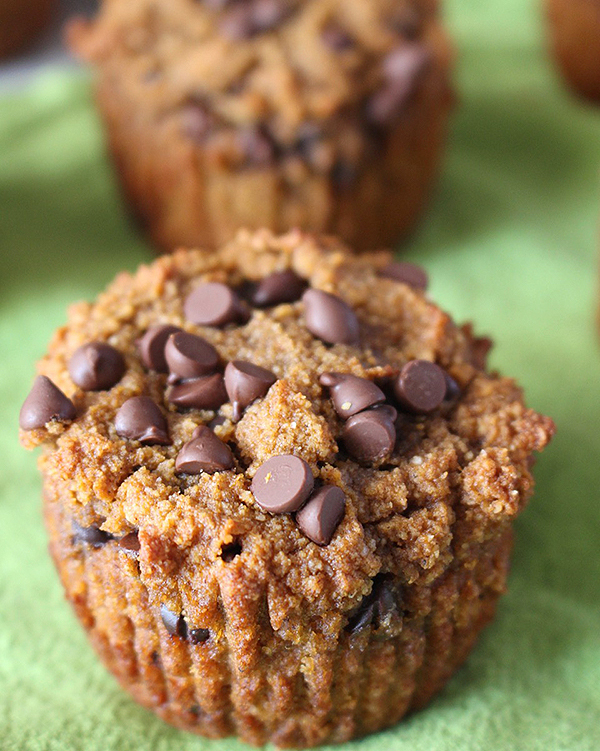 I just couldn’t wait any longer to break out the pumpkin and these muffins did not disappoint! 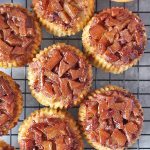 They are kind of a cross between a muffin and pie- not quite as dense as pie, but not quite as fluffy as a traditional muffin. They are absolutely perfect and I couldn’t quit eating them! 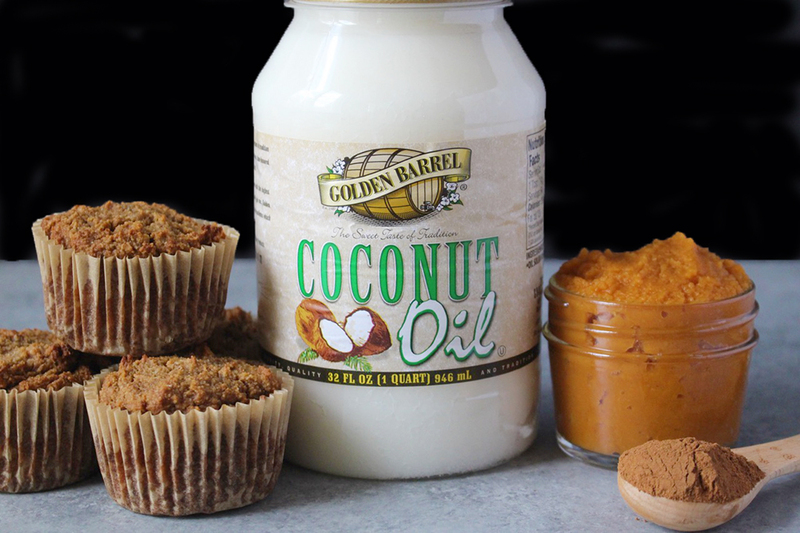 Using Golden Barrel Coconut Oil makes them dairy free and helps keep them moist. Using maple syrup means there is no refined sugar used- and it’s not missed at all! Pumpkin and maple go so well together, add the warm fall spices and it’s a match made in heaven. They are so easy to make. Everything is mixed in one bowl, by hand, and they are in the oven in under 10 minutes. The smell that fills your house while they’re baking is another reminder why I love fall so much! The cozy, comforting aroma of fresh baked goods is the best! Once they’re baked they are best stored in the fridge after 24 hours. Paleo baked treats tend to not last as long at room temperature- eat them cold or warm them up for a few seconds. Both ways are so good! I made two batches and added some chocolate chips to one. Chocolate and pumpkin are a great combination! I am kind of a purist and like the plain ones the best, but if you love chocolate then you have to try them that way. 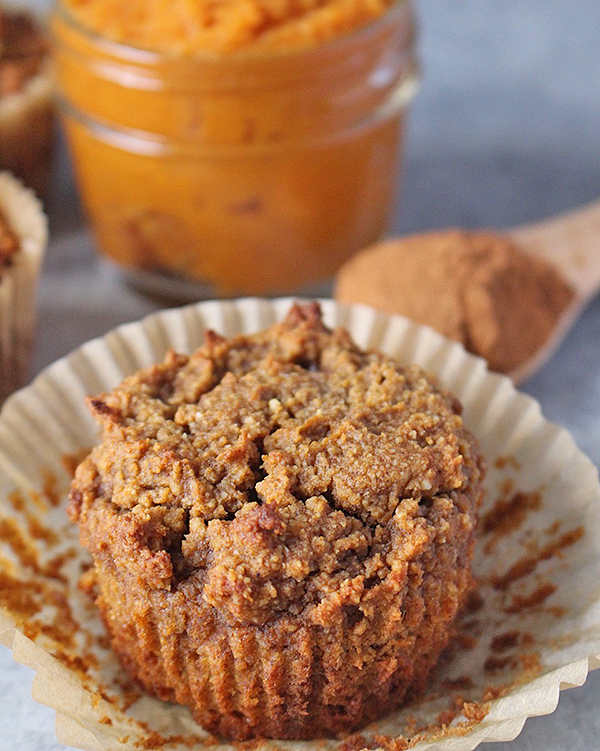 These muffins are tender, just the right sweetness, and perfectly spiced. 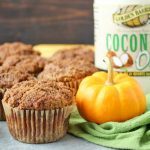 If you love pumpkin pie then you will love these muffins! All the flavor, but easier to make and hand-held! Made these yesterday and I’m in love! Just had one this morning for breakfast and it tastes even better than yesterday! I didn’t add the chocolate chips (I’m a purist!) but I may next time because I imagine they will taste even yummier! Thank you for a great recipe! You’re welcome, Christine! Thank you for trying them and for the great feedback! Going to make these right now. I have some pumpkin left from Sunday when I made the Jay’s Baking me Crazy pumpkin coffee cake and it was delicious! I’ve been making a paleo bullet pumpkin spice coffee in the mornings but need to use this pumpkin up! I need to buy smaller cans apparently 🙂 Can’t wait to try these! Here I go!!!! I hope you are enjoying the muffins, Tina! I’m so glad to hear you liked my coffee cake 🙂 That bulletproof coffee sounds amazing- what a great idea! These look delicious!! Think I could make it as a bread?? Have you tried that? Maybe an 8×8 pan or a loaf pan? Thanks, Sarah! Yes, I definitely think that would work. A loaf pan baked for maybe 45-50 minutes. I hope you enjoy! Anyone know about how many calories 1 of these muffins is? Hi Metta- I’m not sure, but there are many sites that you can use to figure that out. My Fitness Pal is a popular one. 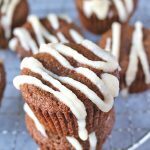 Hope you try these muffins! Thanks for figuring it out, Gretchen! That’s part of the reason I don’t figure it out is because little changes in the recipe can effect the final outcome. Thanks for trying my recipe! My daughter and I have made two batches and are in love! I need to make a third for Thanksgiving but used all of my maple syrup on the last batch; have you subbed honey before? Trying to save myself a trip to the grocer, lol!! Thank you for sharing a wonderful recipe! I’m so glad you have enjoyed them, Melissa! I hope I’m not responding too late. I haven’t tried honey, but I’m sure it will work. I definitely understand saving a trip to the store. 🙂 Have a great Thanksgiving!! Can I make these if I don’t have any Coconut Flour? Would there be a substitute? Hi Renee- you could try adding an additional 1/2 cup almond flour. I hope you enjoy them! These were delicious! Best paleo muffin I’ve had and with the chocolate chips (and minus the pumpkin pie spice) they tasted more like a soft chocolate chip cookie. I’ll be making these again for sure. Thank you! You’re welcome, Linda! Thank you for trying my recipe- I’m so glad you like them! I’m not able to eat maple syrup. Can I substitute stevia or Swerve? Hi Arlene- I’m not familiar with stevia so I can’t recommend that- I don’t think the measurement would be the same. You could use Swerve, but would need a little additional moisture to make up for no maple syrup. Maybe add 1/4 cup dairy free milk. I’m not for sure, that’s just a guess. Of course you could use honey, but it sounds like you’re looking for a no sugar option. I hope that helps and you enjoy them! Lakanto do a sugar-free maple syrup made using monk fruit. It swaps into recipes as a 1:1 replacement. It does have a bit of an ‘aftertaste’, like most natural sugar alternatives (monk fruit, stevia, xylitol, erithrytol, etc) so I don’t use it straight up e.g. on pancakes. But in a baked recipe it’s good, so it’s great to have in your sugar-free store cupboard! Thanks for that info, Kate! Very helpful! I made these today and they are soooo good! 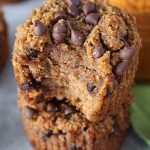 I’ve tried several Paleo pumpkin muffins and these are my favorite…based on flavor and texture. I added raisins instead of the chocolate chips and honey for the maple syrup (didn’t have maple syrup on hand). They are amazing! 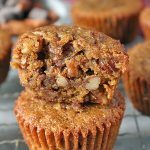 They’re actually even sweeter than I need…I think I’ll use a little less sweeter next time – or maybe just use an overripe banana with a little extra almond flour. Anyway…DELICIOUS!!! 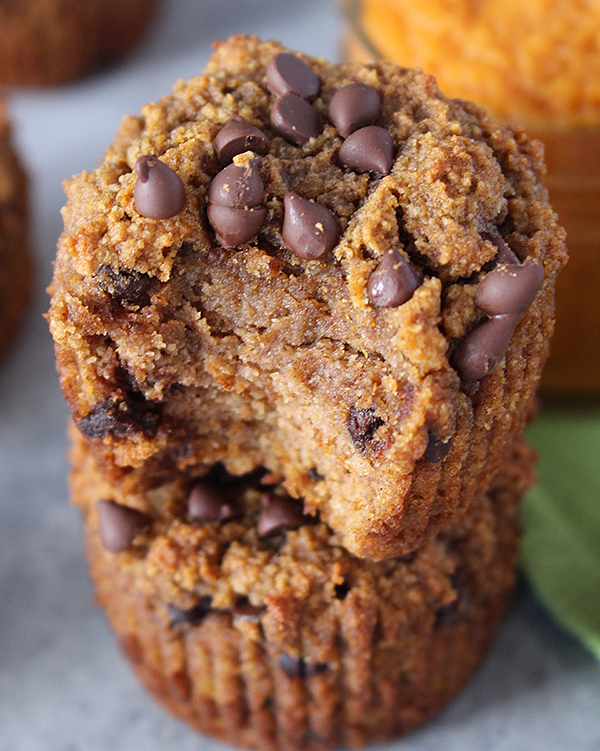 Have you tried these using flax eggs? Hi Lacey- I haven’t tried it personally, but it should work. Hope you enjoy! Hi Mary- that should work. I like to use almond flour because it’s finer and the end result is usually better, but almond meal should be fine. Hope you enjoy! Have you tried substituting the almond flour for one of the Gluten Free flours like Domata? Hi Robin- I haven’t, but I think that would work great. Hope you enjoy! Mine did not rise or take muffin shape. Any suggestions? Hi Monica- I’m sorry that happened. Did you make the recipe exactly as written? Substituting ingredients can make a big difference. Let me know a little more info and I can try to help. These are super delicious. I made these with the Almond Flour and substituted Spelt Flour for the Coconut Flour because I didn’t have Coconut Flour on hand. 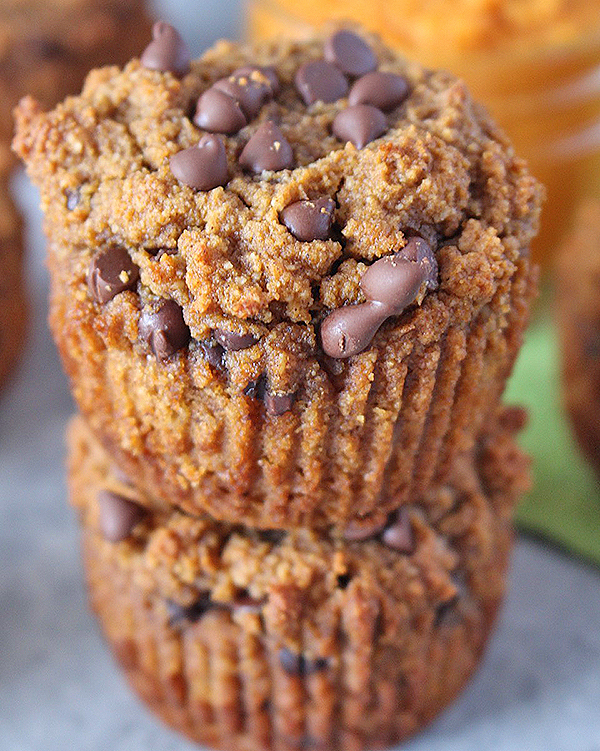 These muffins were perfect as far as the spices and sweetness. Thanks for trying my recipe, Gayle! I’m so glad you like them! Hi Jessica! For the coconut oil, do you scoop out 1/4 c then melt it or does it need to be 1/4 c total after melting? Hi Ashley- it’s 1/4 cup melted, so after melting measure it. Hope you love them! do you have the estimated nutritional info for these? They turned out amazing! I subed 1 cup almond flour (spooned into the measuring cup) for the coconut flour since we didn’t have any and did walnuts instead of chocolate chips and they were oh so yummy. Hi Kat- I don’t calculate the nutritional info for any of my recipes, but you can use a site like My Fitness Pal to help you figure it out. I’m so glad you like them! I wanted to like them but they’re a bit too nutty flavored for me. My parents loved them though! Thanks for the recipe though! Sooooo good. Thanks for sharing this recipe Jessica! Been on Paleo for 2 weeks and feeling great! You’re welcome, Christina! Thanks for trying them! So glad you like them! The muffins are amazing, but you left out one very important step, how to not eat them all in one sitting!!!! LOL!! I’m looking forward to trying more of your recipes. Thank you so much for sharing them. You’re welcome, Remy! Haha- you’re right! They are good. 🙂 Thanks for trying my recipe and I hope you enjoy my other recipes as well. You’re welcome, Debbie! Thanks for trying them! I’m so glad you like them! Hi! I’m excited to make this recipe. I was wondering if you could substitute ghee for the coconut oil? What do you think?. I’ve done that in a paleo cookie before but I don’t want to mess these up if you think it would not work. Thanks! Hi Carol- yes, that will work just fine. I hope you love them! Hi Laurie- No, I don’t calculate nutritional info for my recipes. You can use a site like My Fitness Pal if you want to figure it out. I used stone ground 100% whole wheat flour because I didn’t have almond…..not gluten free anymore but delicious non the less. My young boys loved them! Hi Andrea- No, it shouldn’t be dry. Did you substitute any ingredients? I’m not sure how it would be dry with the pumpkin, coconut oil, maple syrup and eggs. Let me know more info so I can help. WINNER! I followed this recipe exactly (using sugar-free maple syrup) and put the batter in an 8×8 square aluminum cake pan instead of a muffin pan. Baked for 40 minutes. EXCELLENT! Thanks, Julie! So glad you liked them. I love the idea of baking as a cake. Thanks for trying my recipe! I don’t have enough almond flour but plenty of coconut flour and I also have Paleo baking flour, can that be added or substituted for almond flour? I made these a couple days ago and they didn’t form correctly. I’m at high altitude, do you have any tips for how to adjust this for high altitude? I would love to make these with my boys but I don’t have any almond flour – I have cassava, coconut and spelt…? Would any of those work? Hi Katie- I can’t say for sure, but cassava would be your best bet. It does have a different flavor and texture, but you can’t substitute coconut 1:1 and I’m not familiar with spelt at all. Hope that helps! Does anyone know the total carb count on these? Hi Abby- I don’t calculate that for my recipes. You can use My Fitness Pal to figure it out if needed. I made these today and they are amazing. I added a hand full of the mini chocolates and also unsweetened shredded coconut. So Delicious. Do you happen to know the calorie count per muffin? Thanks for trying them, Heather! I’m so glad you like them! I don’t calculate calories for any of my recipes. You can use a site like My Fitness Pal if you need that info.